How to create a custom box? That is the question we get from a great number of businesses looking to create custom packaging in California. To make a custom box you will need to determine what box style is right for you product. There are a few styles to choose from like the most popular custom RSC box. You will need to measure your products length, width and depth so your custom size boxes will fit accordingly. Please remember that the dimensions you enter should be the inside dimensions of the box. Samples are available to make sure sizing is correct. 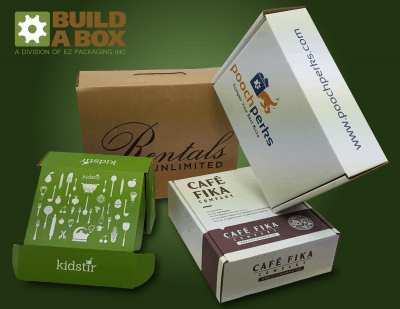 If you want to brand your cardboard boxes with print, we can definitely help you with that.You can go with Kraft custom printed boxes or white custom printed boxes. All we would need is your artwork so we can provide you with a quote on print plates. Artwork should be sent as an AI, PDF or EPS file. Once we get your print plates quoted and made we will send them to production. It usually takes 7-10 days after approval of artwork and sample to ship, barring any setbacks. So if you are in the market for a printed subscription box, custom blank shipping box or a retail box, please use our Free easy-to-use online tool to help you design your very own custom box the right way.